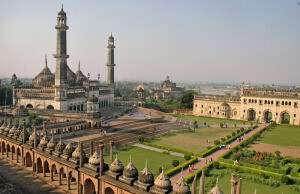 Lucknow: administrative headquarters of the eponymous District and Division. It has always been a multicultural city. Courtly manners, beautiful gardens, poetry, music, and fine cuisine patronized by the Persian-loving Shia Nawabs of the city. Lucknow, along with Agra and Varansi, is one of the 3 cities in the Uttar Pradesh Heritage Arc which is a chain of survey triangulations created by the Government of Uttar Pradesh to boost tourism in the state. A preferred but slow mode of travel, train journey kills the fun of stopping by at intervals and viewing the attractions that the route to Lucknow has to offer. Prior bookings and ticket confirmation worries can make travelling a burden. So book a cab from Wiwigo,com the day you want to take your journey and forget about confirmations and restrictions! Although another way to reach Lucknow from the capital city, you need to wait for ticket bookings and confirmations and traverse extreme weather on bad roads, made worse by a bus journey. When you could instead take a handpicked cab form Wiwigo.com at a much cheaper price than even a volvo.